Designed for effortless product photography, the lighting tent can be quickly assembled and comes with smooth, easy to clean. This Photography Studio is durable, and it has amazing shooting effect. Led photo light box perfect for items like Jewelry, toys, electronics, cosmetics and so on. Standard color temperature: 5500K color temperature make photo color standard. Easy shooting: Press switch comes steady soft built-in illuminant, no need to adjust lighting, portable with highly bright shooting effect. Durable: High reflective cloth material with smooth pure white background, durable for years, no worry about any scratch, deformation or fade, 8000 hours lamp life. Amazing shooting effect: High density white soft light without shade, easy to match with any background paper and camera (adjust with proper lighting exposure). Perfect for items like Jewelry, toys, electronics, cosmetics and so on (items no more than 65% shooting space). ★ Dimensions: 24''x24''/60x60cm. Note: the object for shooting shall not be bigger than 50x50x50cm/20''x20''x20'' . ★ Output lights: Double 60 LEDs light bands with 13,00 lumin. Super bright to provide the adequate light source. This light combined with the silver reflective interior of the tent, provides even lighting to minimize shadows.Your photo will be with pure white background and you don't even need to have the photo copped. ★Led photo lightbox very easy to instal! No other tools needed for the installation and uninstallation.Your bare hands are the only things needed for the installation.， Space saving and very flexible. Can be utilized on various occasions or in different places. ★ Comes with a carrying bag and 4 pieces of background paper boards. The paper boards are wrinkle resistant and water resistant. 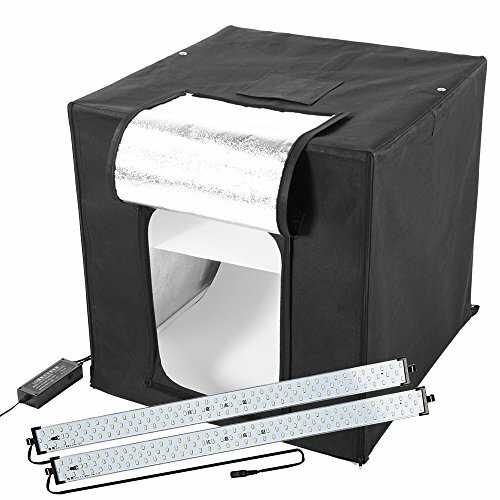 ★ Kit includes: 24x24 inch /60x60 cm photo light cube tent, 4 Backgrounds,Power Cord with AC Adapter and a Carrying Case. If you have any questions about this product by ASHANKS, contact us by completing and submitting the form below. If you are looking for a specif part number, please include it with your message. Photoflex Changing Room, Light Tight Film Changing Tent.